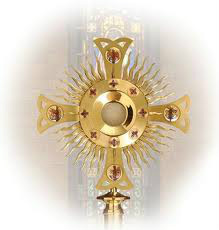 Welcome to our Holy Hour page. On the first Saturday of the month we have a holy hour where we pray for our monthly intention and any other prayer requests we have received either personally or via our blog. On the First Saturday at 10.00 am, Mass is offered for Children around the world and afterwards there is Benediction, a blessing, the Rosary and a prayer to our Lady are recited. All are welcome to come and join in with us at St. Mary's Church, James' St, Drogheda, Co. Louth, Ireland. If you do not live local you can pray with us in your own church or in your home. Please join us as we pray for all young people and children of the world. How quickly time goes by, another month is here and once again we continue to offer prayers at Holy Mass and Benediction for children. Today Fr. Fergal prayed for children who are preparing to make First Holy Communion and Confirmation. During Holy Mass he gave a short talk on the meaning of Lent and how to approach it. All around the world children are being prepared to receive these Sacraments and this month we keep them all in our prayers. The rosary was recited before the Blessed Sacrament and there was the option of going to the Sacrament of Confession. After the Rosary there was Benediction. It was a wonderful time of prayer in the presence of Jesus Christ. All God's little children were prayed for and strangely enough the Gospel for today was the one about letting the little children come to Jesus and not to stop them. So many children are stopped from coming to Jesus and are never taught the faith or even baptised. We thank God for all the little children who will be given the chance to come to know Him when they receive Him in the Sacraments. Please continue to keep them all in your prayers and perhaps this lent you might like to invite a family member or friend to begin praying for children. Today as usual on the first Saturday of the Month, Holy Mass was offered for children and afterwards there was Eucharistic Adoration and Benediction followed by the Rosary and Confessions. Fr. Fergal Cummins our new Curate here in St. Mary's was the celebrant today. Children were prayed for several times during Holy Mass. After Mass I was most touched by the Benediction. There was Jesus present to all in the Monstrance and before Him was a cloud of incense wafting up towards Heaven. There was something mystical and sacred about it. I was moved to almost tears by the sheer beauty of the moment. This months intention is for children who suffer from any kind of abuse and this intention was brought before Jesus in our quiet time of prayer with Him. We are so blessed to have two wonderful Priests like Fr. Phil and Fr. Fergal. Priests who work tirelessly for God and who help us in our prayer for God's little one's. Please remember all God's little one's and not so little this month as we continue to pray. God bless everyone who reads this blog and who prays with us. Yesterday 1st December, we had the holy Sacrifice of Mass offered for the protection of unborn children. Fr. Phil prayed several times during Mass for this intention. He also prayed for the protection of all life from the moment of conception to natural death. We did not have our time of Adoration or Benediction after mass as there was a funeral coming to the church. Prayer for children is offered each month even if on occasion it has to be shortened. We thank God for the gift of our Priests who provide us with the opportunity of Holy Mass. Please pray for all expectant mothers this month of December as they each carry their unborn child. May God help them and guide them in all their actions and may our prayers support them also. May God bless all of you who pray with us. Amen. Once again we had our holy hour where we pray for children and young people. Fr. Phil offered prayers during holy mass for children and after mass the rosary was recited. Mary the lady who usually leads the rosary was not there today so a friend stepped in and lead us all in prayer. It was indeed very prayerful and all present joined in. Fr. Phil concluded with Benediction and we all did our best at the singing. It was a lovely time of prayer. Many thanks to Fr. Phil for helping us to pray for children. He is very busy and still makes time for us. Fr. Joe Campbell has been moved to Mullingar to become the Bishop's secretary. Our new Bishop is Fr. Tom Deenihan, a native of Cork. We wish him all the best in his new post as Bishop of Meath. Other news Fr. Fergal Cummins who was newly ordained less than a week ago will be the new curate in St. Mary's Parish. We welcome him and wish him all the best in his ministry. Please continue to keep God's children in your prayers. Today we had our Holy Hour as usual. Fr. Phil prayed for our intention during the Mass. This month we pray for the protection of life in the womb. With the referendum coming up at the end of the month, prayer is needed. So many people think that choice for the woman is right and yet if we follow the truth that God lays down for us in Sacred Scripture, God's holy word given to man through the power of the Holy Spirit we can see things more clearly. We pray that more people will read the Word of God and will see the truth for what it is and not be lead astray by false teaching or ideas. God is the author of all life and all things belong to him and should be done with Him, in Him and for Him. After Holy Mass the rosary was recited, confessions were heard for those that wanted it and afterwards Fr. Phil said the Benediction prayers. We had a very special ending, a song that was fit for a King, sung by Timmy Regan, a parishioner with a God given voice. There was a good attendance and much prayer was offered. Many thanks to our priests who support us each month and thanks to all who offer prayers for children and young people, may God bless you all. Last Saturday we had the monthly Holy Hour where we prayed for children and young people. Despite the heavy snowfalls priest and people did come out to pray for children and young people. I have to confess, I got my days mixed up and thought that it was not on until next Saturday. One of the ladies who attends each month informed me that the Mass and Benediction did go ahead and it was a good hour of prayer. Please continue to pray for children and young people and if you have not taken up anything for Lent, perhaps you might like to pray for a child or young person. May God bless all who pray for His children. Today we had our monthly holy hour as usual in St. Mary's Church, Drogheda. It was a beautiful peaceful time of prayer. Fr. Phil celebrated Mass and prayed for unborn children and the protection of life. Always in December we pray for the unborn baby in it's mother's womb. It is fitting to do so as it is the month of expectation, that of the coming of our Saviour Jesus Christ. Our blessed Lady who also was with child, gives a wonderful example of motherhood to all women. After Mass, the rosary was recited and we ended with Benediction. Many thanks to Fr. Phil for his ongoing support to us. Please continue to keep children in your prayers. God bless. We continue to pray for children and young people on the first Saturday of every month. Today due to a funeral we were unable to have our time in Eucharist Adoration and Benediction, but children and young people were prayed for at Holy Mass. Our intention this month is to pray for children and young people to become holy and also for all the children and young people who have died. Today is the start of a new month and what a way to start it. We had our monthly holy hour which includes Holy Mass, Eucharistic Adoration, Benediction, confession and the Rosary. All of which are also ingredients for making reparation to our Blessed Lady for 5 first Saturday devotions. Today Fr. Joe offered prayers during the mass for children and young people suffering the effects of war and violence. After mass the rosary was recited as usual. Today there was almost a competition as people jumped in to give out a decade. It is great to see the willingness of people wishing to lead us in this wonderful prayer. As there were a lot of people receiving the Sacrament of Confession, the rest of us had lots more quiet time with Jesus in Eucharistic Adoration. Here young people and their families who are suffering so much pain as a result of war and violence were remembered in prayer before Jesus Christ present on the altar. Our Holy Hour ended with Benediction. Fr. Joe said a beautiful prayer before finishing and we ended with a hymn to our Blessed Lady. Many thanks to everyone for all your wonderful prayers and thanks also to Fr. Joe Campbell for all his help and support. Today we had our monthly Holy Hour. It was great to be back praying with the group as I had missed a few due to personal circumstances. Today Fr. Joe prayed for sick children, holy mass was offered for their intentions. After mass the rosary was recited and we had a quiet time in Adoration before the Blessed Sacrament. Here we all brought the intentions of our hearts and those requested to Jesus. The hour ended with Benediction and prayers. Please continue to pray for children as your prayers will be their strength in life. God bless and thank you. On Saturday last we had holy mass offered for children who are deprived of peace. Fr Phil offered several prayers for this intention. It was the feast of St. Teresa, the little flower. A young Saint who lived her life in perfect peace with Jesus. I asked this beautiful Saint to help all God,'s little ones who suffer so much and are without peace. We did not have Eucharistic Adoration or Benediction for the past two months. We commend everything to God in prayer and pray that His will shall be done. Thank for all your prayers and please do keep praying, it may be the only hope a child may have. Today we prayed for all young people preparing for exams. Fr. Joe offered Holy Mass and prayed several times for this intention. After Mass we prayed the rosary and had Eucharistic Adoration. We ended with Benediction. It was a beautiful time of prayer and all children. were prayed for. Please continue to pray for God's little children. Thanks and may God bless you. Today we had another wonderful hour of prayer on behalf of God's little children. Fr. Phil was there as usual helping us with our prayer. God is so good to us in giving us this priest to help us in our mission of prayer for children. We thank God for Fr. Phil and Fr. Joe and we ask Him to bless them both. Holy Mass was offered for our monthly intention that is praying for children who have evil weapons placed in their little hands and children who are robbed of their innocence. Mass was so beautiful and we even managed some singing at Benediction. A good number of people stayed to pray the rosary after mass. It is always so uplifting to hear the power of a group of people praying together, prayer somehow seems to lift the roof of the church and fill one's heart with courage and joy. After the rosary, Fr. Phil continued with Benediction. We were blessed by Jesus present in the monstrance and after we prayed the Divine Praises a prayer which I love as I used to say it every Sunday as a child with my dear mother after Sunday evening mass. We recited the prayer to Our Lady and we ended with a hymn to Our Blessed Mother, Mary. Please continue to help and support us with all your wonderful prayers. God bless and thanks. Today we had our first holy hour of the new year. Fr. Phil celebrated Holy Mass. It was lovely and prayerful and this months intention (praying for children with no home) was prayed for. The rosary was recited and many people were present for it. People travelled from Duleek to be there with us in prayer as did people from other parishes. Our silent time with Jesus in Eucharistic Adoration was beautiful and here all the intentions for children were placed before our Lord and Saviour, Jesus Christ. The hour ended with Benediction. Everyone present received a blessing and the Divine Praises were prayed, concluding with our prayer to our Blessed Lady. We are so blessed to have this time where we intercede and pray for children at home and around the world. Where we are helpless and there is little we can do for a lot of children there is one big thing we have in our power to do and that is pray for them. This new year may our prayers be a strength and a source of comfort for them. Well today we ventured out for our Holy Hour amidst storm Desmond. It was very wet and windy but in our hearts it was warm. Fr. Phil offered holy Mass and prayed for the respect of life from conception to natural death. He prayed for the unborn which was our monthly intention. The mass was well attended. Afterwards the rosary was recited and we had a time of Eucharistic Adoration. Here all your intentions were whispered to the Lord in silent prayer. The holy hour ended with Benediction and Fr. Phil prayed our prayer to Our Blessed Lady. The singing, well that was not the greatest, the voice was weak and rather frog like but perseverance won through, thank God for the two young Franciscan sisters who came to the rescue with their beautiful voices. Please continue to keep our monthly intention (Praying for the protection of the unborn) in your prayers. God bless. Today we remembered all our loved ones who have died and in a special way we remembered children and young people who have died and also their parents who suffer their loss. Fr. Phil celebrated Mass and prayed for children. He also recited our prayer to Our Blessed Lady. Afterwards we had time with Jesus in the Monstrance. The rosary was recited and people were almost battling to give out a mystery. More new people were present which is encouraging. After the Rosary we had Benediction which was beautiful. All the monthly intentions were placed before the Lord in quiet prayer. Again many thanks to Fr. Phil for his continuous support. Please keep praying and if possible make a little sacrifice during the month of the holy souls. God bless. Today we resumed our Holy Hour after a long summer break. We normally break for July and August to allow for holiday time but this year we had to include September in that break as the Parish had a huge celebration of 25 years Eucharistic Adoration. The prayers still went on despite the long break. Today it was a joyful occasion and people were glad to be back praying before the Blessed Sacrament. Fr. Joe offered Holy Mass and prayed for homeless children and children affected by the refugee crisis. We had extra time in Adoration as confessions seemed to go on and on and we had to wait for Fr. Joe to finish with Benediction. The silence in the church was beautiful and we were privileged to be there. Fr. Joe ended the Hour with a beautiful Eucharistic prayer and a hymn to Our Blessed Lady. Please continue to pray for God's little children, they need your prayers. Thanks and God Bless. Our June holy hour took place today. Fr. Phil prayed for young people sitting exams at this time and also for young people discerning their vocation in life. A good crowd attended mass little children with their families also. What was most striking was, just as Fr. Phil was placing the white Host into the Monstrance a little baby was chuckling away down the back of the church. Its little chirps pierced the silent church and the sounds were just heart warming. I immediately thought of the infant Jesus when he was presented in the temple, would he have cried out and chuckled just like this small child. "Let the little children come to me and do not stop them". Today Jesus must have been delighted with this little small child. The rosary was recited and three of the mysteries were prayed by men, usually its a load of women but the men are becoming just as eager to jump in and pray which is wonderful to see. After the rosary there was Benediction which was beautiful. It was a special time of prayer with the Lord and we thank God and our two wonderful priests Fr. Phil and Fr. Joe for providing this time of prayer. As its summer time we will be taking a break, so please keep up your private prayers and have a blessed summer. Today we had our monthly holy hour as usual. A little boy sat with his Grandparents and family behind me. He could not have been more than two or three. He had the beautiful simplicity of a child and said out loud what was on his mind. His granny tried in vain to silence him but failed to everyone's delight. Out of the mouth of babes come words of wisdom. "Is he going to sing, is he going to sing" words of concern from the little boy. At the end of mass he piped up again and said "Ah that was nice, ah that was nice, wasn't that nice". How much these words must have pleased our Lord and Saviour, Jesus Christ. How many of us say to Jesus, ah, that was nice? After mass the rosary was recited in the presence of the Blessed Sacrament. There was a queue of elderly ladies only too delighted to pray this beautiful prayer. As there was a large queue for confessions we got a lot of extra time with Jesus. During this time we all prayed for children around the world and their families especially all who are suffering at this time. During the mass Fr. Joe remembered all who were suffering as a result of the recent earth quake. He also remembered all who will be making First Holy Communion and Confirmation in the coming weeks. We ended our prayer time for children with Benediction. At the end of Benediction Fr. Joe prayed part of The Universal Prayer (attributed to Pope Clement XI). He prayed each line so slowly and beautifully that they could only touch a soul in a Godly way. Here is the part that was prayed. Today we had our monthly holy hour. As usual Mass was offered and our monthly intention was prayed for. This month we are praying for children/young people who are preparing to receive the Sacraments. We had mass and our monthly intention was prayed for. This month we are praying for children/young people around the world who are preparing to receive the Sacraments of Reconciliation, First Holy Communion, and Confirmation. Today's Gospel was about the prodigal son. Fr. Phil spoke a few words about it. The most striking words for me were "can you act like God?" He was speaking in relation to our forgiveness. Can we act with the compassion and mercy of God. What a challenge. It was a beautiful celebration of the Eucharist and afterwards the rosary was recited. It was wonderful to hear the large volume of prayer being said. I was tempted to look around to see exactly how many people were there but decided not to as it would be disrespectful to Jesus present in the Monstrance. After we had benediction. It was a beautiful gentle prayer time with Jesus and all your intentions were brought before the Lord. Let us keep Fr. Phil and Fr. Joe in our prayers and ask God to continue to bless them both. Please keep up your own prayer for children as it is much needed. God bless you and thanks. Today we had our first Holy Hour of the new year. This month we are praying for new beginnings and a change of heart so that our world may be a better place for children and young people to live in. Fr. Joe celebrated holy mass and then we had rosary, Eucharistic Adoration and Benediction. It was a quiet time with the Lord in prayer but very beautiful. All your children and families were prayed for. Fr. Joe prayed at the prayers of intercession during mass that young people would come to know the Lord in their lives and to experience his love. He also prayed for our monthly intention for new beginnings and change. The rosary was recited, there did not seem to be as many people praying as usual. For a moment I felt my heart sink as I thought how many had left after mass and so few had stayed with the Lord in silent prayer. I was quickly reminded of the line from scripture "where two or three are gathered together in my name I am there with you". Indeed there were a lot more than two or three and yes I was reassured that God was with those of us who had remained in prayer and our prayer would indeed be heard. It was a special time where all the children of the world were placed before God in prayer. Thanks to all who pray for children and support us in any way. A special prayer was offered today for Bishop Denis Nulty. Bishop Denis was the person who said yes to God when we asked him for a holy hour to pray for children. Today as I fumbled in my bag for the prayer card with the pray to Our Lady I came across a prayer card with Fr. Denis' picture on it. I was prompted to pray for him. Please keep him in your prayers also. We remember Fr. Phil and Fr. Joe also in prayer because without these priests, God's willing servants, we would not have a holy hour for children. May the peace of the Christ Child be with you all this year and may your homes and families be places of love and blessings. "I would not have missed it for all the world." These were the words I spoke to Fr. Phil after the holy hour this morning. This month our holy hour was not on the first Saturday of the month due to All Saints Day falling on that day. Instead Fr. Phil decided much to our delight to move it forward by one week to todays date. It was well attended. This month we prayed for children and young people to grow in holiness and also for children/young people who had died, very much in keeping with the theme of Saints and Souls. Today's holy hour was tinged with a little sadness but also much joy. Our dear friend and parishioner Margaret Tiernan passed away suddenly during the week. What a fitting time for anyone to go to their reward. Margaret was a beautiful person in every way. Her life was dedicated to God, her family and Parish community. She was also a member of St. Joseph's Young Priests Society and she always joined us at our pray for children holy hour. She would often give out a decade of the Rosary. She will be sadly missed but no doubt will enjoy her reward with God in Heaven. Fr. Phil prayed for our Intention during the mass and after we had Eucharistic Adoration, Rosary and Benediction. Fr. Phil sang beautifully and we all joined in. It was as usual a special time with the good Lord and all your intentions were prayed for. Please keep up your wonderful prayers for children/young people where ever you are and may God bless you all. Today we prayed for sick babies, children and young people. Our hour of prayer began with Holy Mass as always and afterwards we had Exposition of The Blessed Sacrament followed by Benediction. Our time of prayer was very quiet and special as its a time with the Lord, Jesus Christ, Himself. Fr. Joe Campbell was the celebrant today. We thank him for all his wonderful help and assistance to our group.Please continue all your prayers as they are much needed. Today we resumed our hour of prayer where we continue to pray for children, young people and their families. As usual we took a break during the holiday months of July and August and are now back in full swing. This morning we had mass at 10.00am where our September Intention was prayed for. (we prayed for the protection of children, young people and their families against violence and war and we also prayed for the parents and family of the three boys who died in Cork during the week). After mass we had Exposition of The Blessed Sacrament and the rosary was recited. It was great to have so many people jumping in to give out a decade of the rosary normally its hard enough to get people to say it and today was so different. This was encouraging for all present. Fr. Phil heard confessions while the rosary was being recited. We ended our hour of prayer with Benediction. It was a beautiful quiet time of prayer and all your intentions were placed before the Lord. It is important that we keep praying for children, young people and even families. In our modern world it is these innocents that are vulnerable and often the victims of injustice and violence. Many thanks to all who pray for Children and thanks also to Fr. Phil and Fr. Joe for all their help and support. Yesterday we had our Pray for Children Holy Hour in St. Mary's Church, James' St., Drogheda, Co. Louth, Ireland. It began as always with Mass. Here our monthly intention - praying for children preparing for the Sacraments was prayed for. Fr. Joe prayed in the words of Pope Francis and Pope Emeritus, Benedict XVI. "We pray also that adults should bring reverence and love to the task of preparing children for these Sacraments." (Pope Benedict XVI, April 22 Regina Coeli address). After Mass there was Exposition of the Blessed Sacrament and the rosary was recited. Confession was also available for those wishing to receive it. People prayed quietly and all your intentions were placed before the Lord, Jesus Christ through the hands of His Blessed Mother, Mary. The hour ended with Benediction and our prayer to Our Lady. It was a very peaceful quiet time of prayer where all God's little one's were prayed for. Thank you to Fr. Joe for his constant support to our prayer time and thanks also to all of you who pray for children. May God bless you all. Last Saturday 1st February 2014, we had our second Holy hour of the year. Fr. Joe Campbell celebrated Mass and our February Intentions were prayed for. After Mass, the Rosary was recited after the Blessed Sacrament was exposed. It was just wonderful to hear so many people praying the Rosary. I am always amazed to hear heartfelt prayer lifting up to God and Saturday was just that. All your intentions included on the prayer request page and requested by phone or email were prayed for. During Exposition of the Blessed Sacrament confessions were being heard. Due to the large numbers attending we got an extra 15 minutes in quiet prayer before the Lord. The time of prayer ended with Benediction and the prayer to Our Blessed Lady. Many thanks to Fr. Joe for all his help and prayers. If you live in Drogheda or the surrounding area please do come to our next Holy hour which will be on 1st Saturday in March in St. Mary's Church, James' St., Drogheda. All are welcome to come and pray before the Lord. If you need a prayer request, please write it on our request page. God bless. Today we held our first holy hour for 2014. Fr. Joe Campbell celebrated Holy Mass and prayed for the protection of young people against the misuse of drink. After Mass the Rosary was recited before the Blessed Sacrament. There was time for silent prayer before Benediction and the Hour concluded with our prayer to our Blessed Lady. Despite there being no heat in the church people remained to pray. It was a beautiful time with our Lord, Jesus Christ, all the Children of the world were prayed for and all petitions and requests were placed before the Lord during the mass. If you wish to have your intentions prayed for at our next Holy Hour please leave your request on our prayer requests page and we will be happy to include them in our February Holy Hour.